The "Legendary Edition" Halo 4 console bundle, outed on Thursday, was officially revealed yesterday at Comic-Con. 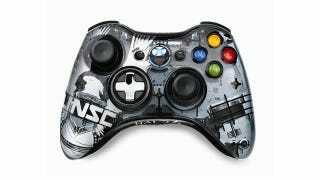 What we didn't know is that it'll have some Halo 4-themed controllers sold separately. For those who want a piece of Halo themed hardware but can't take the $400 the full console package costs, a custom gamepad will run the usual $59.99 and feature a design that is separate from the controllers paired with the Halo 4 Xbox. The gamepads sold separately appear to feature blue lights for the quadrants surrounding the dashboard button, instead of the usual green. The game arrives Nov. 4; listings have the controllers available Oct. 21.